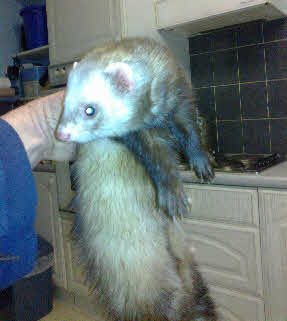 With the loss of Snowy, for the first time at keeping ferrets I lacked a Hob ferret. During March 2015 I received a telephone call from a veterinary practice asking if I would be willing to take a ferret that had been brought to them. No one wanted to claim him, so I agreed to take him. He was described as very friendly, but I was warned that he had been fetched to there by the owner of pet rabbits he killed, I understand he had broken into a rabbit pen. Freddy along with Alfie has been taken to children's parties promoting ferrets.